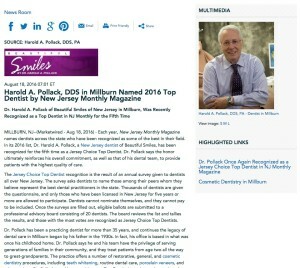 Dr. Harold A. Pollack of Beautiful Smiles of New Jersey in Millburn, was recently recognized as a Top Dentist in NJ Monthly for the fifth time. Millburn, NJ – Each year, New Jersey Monthly Magazine names dentists across the state who have been recognized as some of the best in their field. In its 2016 list, Dr. Harold A. Pollack, a New Jersey dentist of Beautiful Smiles, has been recognized for the fifth time as a Jersey Choice Top Dentist. Dr. Pollack says the honor ultimately reinforces his overall commitment, as well as that of his dental team, to provide patients with the highest quality of care. The Jersey Choice Top Dentist recognition is the result of an annual survey given to dentists all over New Jersey. The survey asks dentists to name those among their peers whom they believe represent the best dental practitioners in the state. Thousands of dentists are given the questionnaire, and only those who have been licensed in New Jersey for five years or more are allowed to participate. Dentists cannot nominate themselves, and they cannot pay to be included. Once the surveys are filled out, eligible ballots are submitted to a professional advisory board consisting of 20 dentists. The board reviews the list and tallies the results, and those with the most votes are recognized as Jersey Choice Top Dentists. Dr. Pollack has been a practicing dentist for more than 35 years, and continues the legacy of dental care in Millburn began by his father in the 1930s. In fact, his office is based in what was once his childhood home. Dr. Pollack says he and his team have the privilege of serving generations of families in their community, and they treat patients from age two all the way to great-grandparents. The practice offers a number of restorative, general, and cosmetic dentistry procedures, including teeth whitening, routine dental care, porcelain veneers, and other options. Dr. Pollack says his recognition as a Top Dentist is not just an honor, but also a humbling reminder of the commitment he has made to patients and the dedication of his entire team to provide each and every patient with the absolute best in care. Dr. Harold A. Pollack is a Charter Member of the American Academy of Cosmetic Dentistry’s New Jersey Chapter and a Fellow of the Academy of General Dentistry. He is also a member of the New Jersey Dental Association, the American Dental Association, and other organizations. Dr. Pollack is a graduate of the Temple University School of Dentistry and has completed more than 5,000 hours of continuing dental education. He has been recognized as one of “The Best Dentists in America,” and has also been named by New Jersey Family Magazine as a “Favorite Kid’s Doc.” Dr. Pollack is available for interview upon request. To learn more about Dr. Harold A. Pollack, please visit beautifulsmilesnj.com or facebook.com/drharoldpollack.